The system works on both Windows and MacOS X and the OS specific software appears when active on that OS. On Windows there’s a standard Autorun file which automatically installs the software when the dongle is plugged in – Neat. As an added feature, the dongle also has a slot for a MicroSD card which appears as another drive (removable media) on Windows and MacOS X. Compared to other dongles (well specifically the Huawei E220 and brethren) it’s very svelte at 75 x 25 x 12mm and weighs a mighty 50g. There’s an end-cap that covers the USB plug. The Virgin variant comes in black and has the Virgin logo on it in shiny silver. The packaging is huge for such a little device, but the box contains a SIM, some manuals and a USB extended cable. The dongle itself has 3 indicator lights to show what it’s doing. If the LED is green, it’s connected to GPRS/E.D.G.E, if blue then 3G and cyan, you’ve got a HSDPA connection. The dongle seems pretty reliable (Virgin is an MVNO on top of T-Mobile) and connections held while browsing the web, reading Email etc. 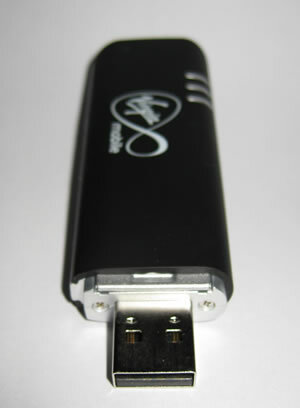 Though the dongle was only tested in London, a HSDPA connection was maintained for several hours which achieved a maximum download speed of 150.2KB/s and a maximum upload speed of 14.7KB/s. Skype didn’t work that well, text IM chatting was fine, but the audio was extremely choppy. Virgin’s software was working well until the dongle was unlocked (using DC-Unlocker at which point it started failing to establish a connection. I guess there’s a lesson. I managed to fix using Launch2Net, this does clever things on MacOS and makes it very easy to use mobile phones/dongles/data cards with a Mac. Unfortunately it took a while to set-up to recognise Virgin’s network (as it assumed the E160 was using T-Mobile). With a bit of fiddling with the settings it sprung to life. A big advantage of using Launch2Net is that is has some sensible defaults that will close the connection when it has been idle for a certain time, connected for a certain time, or after a certain amount of data usage. The Virgin dongle is a neat device and the software works both on Windows and MacOS X (assuming you don’t mess with the hardware), the ability to use it as a microSD reader is an added bonus. The dongle is just the right size to stick into a laptop – though it will cover neighbouring ports and it may be worth using the extension cord if that’s a problem. Network connectivity is stable and reliable for applications such as web, it may not be so good for VoIP or video.